In our October harvest of freebies, we have one more pawesome gift for you, thanks to the good doctor Demian Dressler, aka the Dog Cancer Vet, creator of the Dog Cancer Kit. 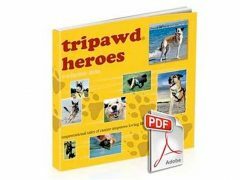 Tripawds is honored to have our Greyhounds Rock Canine Cancer Conference appearance be partially sponsored Dr. Dressler and his crew who created the Dog Cancer Survival Guide and comprehensive Dog Cancer Kit. 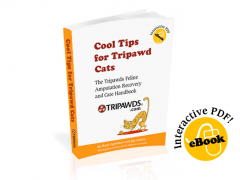 They have generously provided copies of the book to give away at the conference and here at Tripawds! Share this post using the link below. Your secret question will be revealed. In plain English, Dr. Dressler discusses what you need to know about canine cancer, so that you can handle treatment decisions wisely and confidently. He lays out all of the options from cancer diagnostic tests and treatments to the best anti-cancer nutrition plans and caring for your own mental health. Dressler doesn’t leave a stone unturned. You’ll learn about both eastern and western approaches to cancer care, and he will tell you ways that you can blend a little bit of each to create a full spectrum approach for treating your dog. We can’t recommend this book enough. It’s really the best book on canine cancer that you can read, and his Dog Cancer Kit is even better for continuing your canine cancer education, with bonus material like worksheets, podcasts and monthly webinars where you can ask him questions about your specific situation. Use the share link below for your chance to win a copy of the Dog Cancer Survival Guide or visit dogcancerguidebook.com to learn more about Dr Dressler’s comprehensive Dog Cancer Kit, an indispensable tool to treating and coping with your dog’s cancer. Hurry and enter to win the Dog Cancer Survival Guide giveaway! This contest ends on Sunday November 4 at Midnight Eastern time. Winner will be announced the week of November 5th. ( herbs, vitamins,) and looking into acupuncture. At the moment, just holistic, we have decided against chemo for the time being, so we can research all options properly. Charlie, diagnosed in March and a Tripawd since April, is receiving traditional and alternative therapies. We are on our third try with chemotherapy, since lung mets were found in September 🙁 We also do herbal supplements, acupuncture, swim therapy (to keep that remaining back leg strong!) and chiropractic care. He is happy and doing really well, so we will keep fighting the fight every way we can.